The game brings everyone’s favorite web slinger off the big screen and into players’ homes to get a more intimate look into the character. From the start, players are thrown into Peter Parker’s room, which is filled with foreshadowing and easter eggs, that any Spider-Man fan would instantly recognize. The first cutscene has a beautiful transition into one of the most entertaining aspects of the game, web-swinging through New York City. The game is very detailed and allows players to see the world from Spider-Man’s point of view of, showing how intense and swinging through the Big Apple is. New moves players learned throughout the game are based off of a skill tree that players must upgrade as they level up and progress through the story. Along with unlocking skills, there are a numerous new gadgets like the spider drone, which makes facing enemies easier and more entertaining. At first, combat seems like the average punch and dodge system, but with the skill tree, players find themselves disarming enemies and throwing their weapons back at them, or even throwing web bombs, which make multiple enemies stick to walls. Players can even take a stealthy approach to defeating foes and remain undetected the whole time by using certain gadgets, moves and structures that can be used for their height advantage. There are many suits to choose from and gamers can acquire them by leveling up and gathering the right materials. The best part of each suit is that they have their own individual power-ups and special abilities. Once unlocked, players can swap suits while keeping the abilitis of others. As progress is made through the story, players will see new side missions and encounters throughout the city. The fast travel feature is fun because the loading screen for fast travelling shows Spider-Man bobbing his head to a beat that a passenger is playing from a boom box. From stopping drug deals to catching pigeons for a man named Howard, to completing research labs for Harry Osborn, players will find themselves busy even when they aren’t progressing in the story. 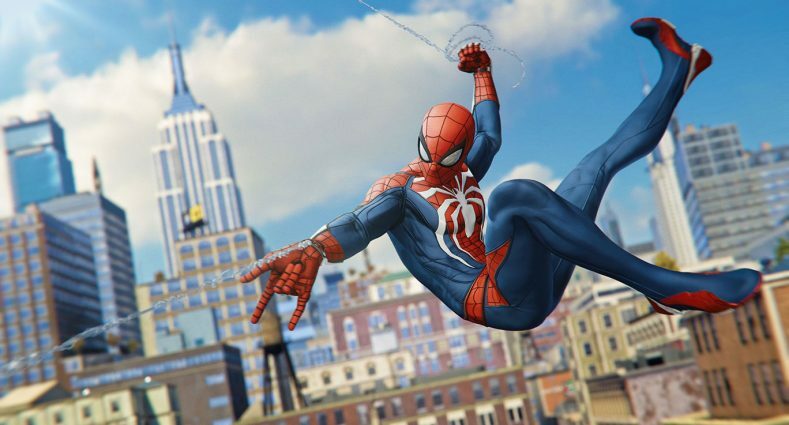 Players might even spend hours swinging around the city enjoying the beautifully detailed scenery, finding buildings or locations they had never seen before or recognized from a Marvel show or movie. There is a learning curve when swinging, but once mastered, players will feel like the wall crawler himself. Previous Spider-Man games allowed players to web swing, but this game in particular makes the player feel like New York City is a concrete jungle where no obstacle is too high or too challenging to get through. One interesting aspect of the game is playing through multiple perspectives, not just as Spider-Man. There are certain points where players can be Peter Parker, Mary Jane or Miles Morales, which was quite entertaining. When playing Parker, players will be able to access Octavius Industries and do puzzles that help both himself and Dr. Octavius with their research. The voice acting is done perfectly for all characters. Spider-Man has the same personality as in the movies and comics, full of puns and jokes to lighten the mood even in the most difficult battles. Throughout the city, there are hidden backpacks that hold mementos from different times in Peter’s life. Each is unique, such as a piece of Rhino’s horn or even Peter’s first pair of glasses that were seen in the comics. There are landmarks that tie into the Marvel Cinematic Universe. It was amusing to dive from the top of the Avengers tower, and swing by Dr. Strange’s Sanctum Sanctorum or the Wakandan Embassy. Players will recognize the game’s villains like Kingpin, Shocker, Electro, Scorpion, Rhino, Vulture, Taskmaster and Mister Negative. On the way to defeating these villains, gamers will also know other notable Marvel characters like Black Cat and Otto Octavius who, eventually becomes Dr. Octopus. Throughout the story, players witness tension between the lives of Spider-Man and Parker and will understand why it is so difficult to live a double life. The plot thickens as players progress, and it doesn’t let gamers who love a good story down. The photo mode that is included in the game is a blast to use. Players can either take a normal photo with multiple effects and photo customization, or even take a selfie as Spider-Man 0in front of the many recognizable structures throughout the city. Even players who are new to the series are bound to have a blast and find themselves lost in the web-swinging, action-packed, dramatic universe. “Spider-Man” was released on Sep. 7 and is rated T for teen.